The snow will make for a difficult commute and will likely trigger significant flight delays Thursday in Boston, New York City, and Philadelphia. The setup for this snow event features a pattern seen frequently in past winters, but not so much this winter. A sharp southward plunge of the polar jet stream in the East will spawn an area of low pressure off the Eastern seaboard by Thursday. With some cold air in place behind departing Winter Storm Maya, Niko should wrap moisture into sufficient cold air to wring out snow, heavy at times, near the Interstate 95 corridor. 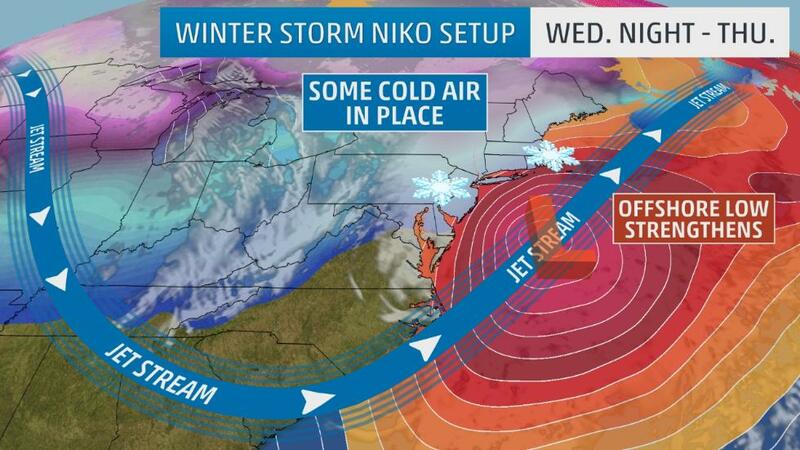 As virtually always is the case, there are uncertainties on the exact track and forward speed of Niko. The latest forecast guidance is suggesting a track favorable for widespread accumulating snow, with the heaviest amounts from eastern Pennsylvania and the New York City Tri-State area into southern New England. Here's the timeline and how much snow could fall. 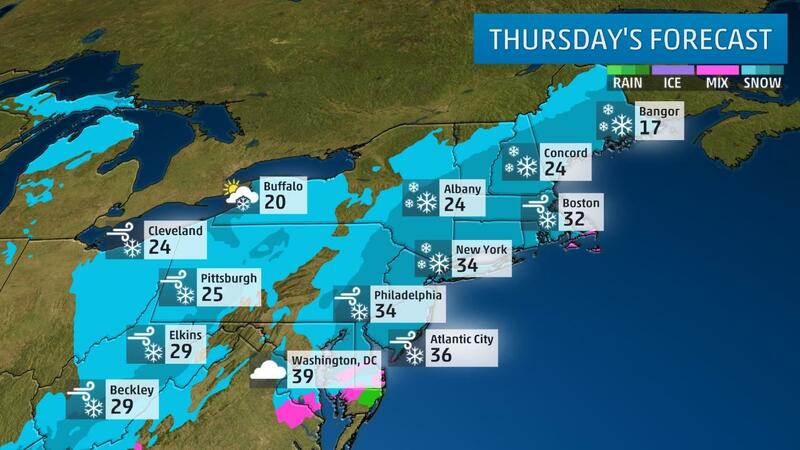 Snow spreads from the Ohio Valley and Appalachians into the Northeast. The line separating rain from snow is still uncertain, making the forecast for the transition from rain to snow difficult from far southeast Pennsylvania to Maryland, the Delmarva Peninsula and northern Virginia. 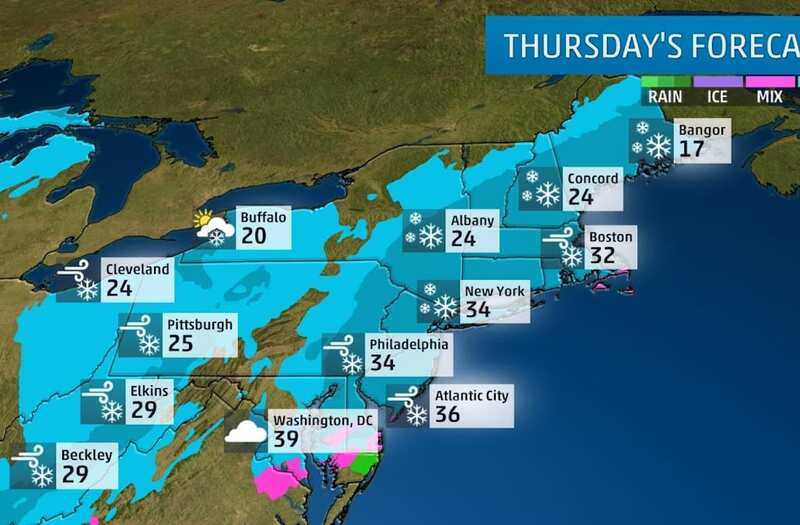 At least some snow is most likely overnight north of Interstate 95, from north of Philadelphia to southern New England, including the New York City Tri-State area. Snow, heavy for some, may linger in parts of the mid-Atlantic states as far north as New York City through the morning before tapering off/ending by early afternoon. Farther north, snow, heavy at times, will persist much of the day in New England, especially in southern and eastern New England. 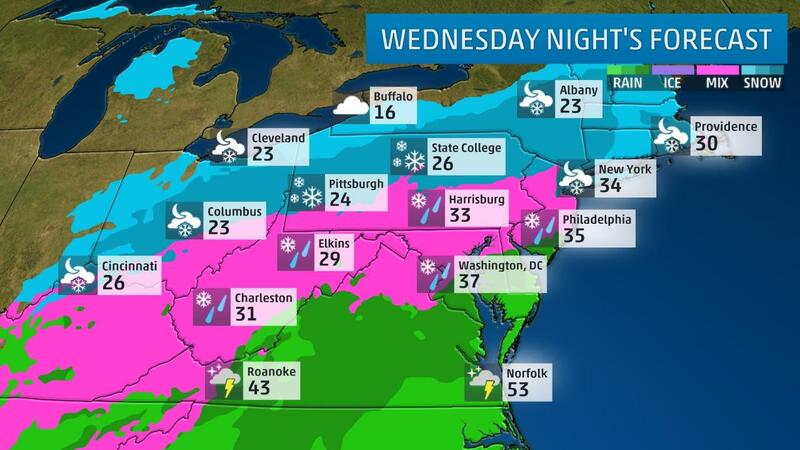 Snow will gradually taper off in far eastern New England Thursday night. They will be most persistent in Cape Cod (ocean-effect bands) and in Downeast Maine. Winds will intensify quickly along the northeast coast Thursday, with gusts over 50 mph possible in far southeast New England, capable of some downed tree limbs and wires. Some minor coastal flooding is also possible in eastern Massachusetts. Thursday AM commute impact: Philadelphia, Harrisburg, New York City, possibly parts of Baltimore and Washington D.C. metros; Flight delays likely. Thursday PM commute impact: Boston, Hartford, New York City; Lingering flight delays possible as far south as Philadelphia. 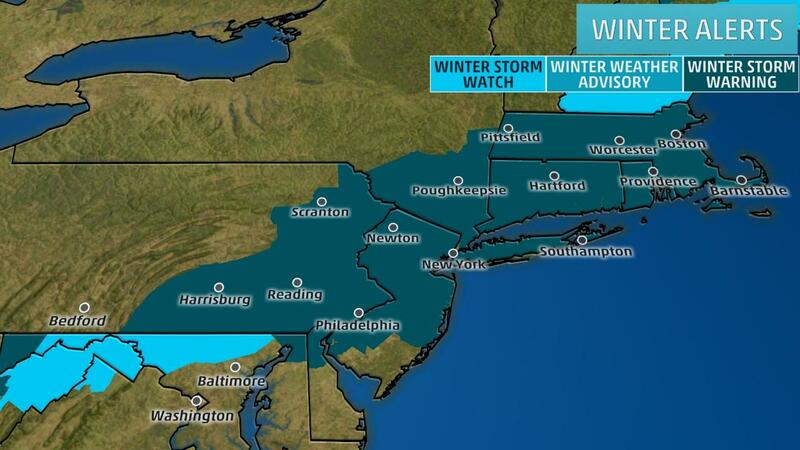 In general, moderate to locally heavy accumulations of a half-foot or more are possible from eastern Pennsylvania and much of New Jersey into southern and eastern New England, including the Boston metro area, New York City Tri-State area and possibly the Philadelphia metro area. Parts of Long Island, southeast Massachusetts and Downeast Maine could see up to a foot of snow. Lighter amounts are forecast farther south into the mid-Atlantic region, including the Baltimore and Washington D.C. metros. Blowing and drifting snow is likely, at times, in far southeastern Massachusetts, including Cape Cod, Nantucket Island and Martha's Vineyard, with some whiteout conditions possible, Thursday and Thursday night. Before reaching the East, a stripe of snow will also blanket parts of the central Plains and Ohio Valley, with generally light to moderate snow. Around 2 inches of snow had fallen in Omaha, Nebraska, and in parts of the Des Moines, Iowa, metro area Wednesday morning. A stripe of northern Nebraska picked up heavier snow, lead by 10 inches of snow in Ainsworth. If you love snow, this winter has been a big disappointment in parts of the mid-Atlantic states. Baltimore's paltry 0.7 inches of snow through Feb. 7, just under 12 inches below average for the season, has been the third-least snowy start to the season on record, dating to 1949-1950, according to NOAA's ACIS database. Harrisburg, Pennsylvania's, 1.9 inches for the season is over 15 inches below the average to-date. Even for some Northeast locations that have seen some snow this winter, it's been a while since there has been snow that has required a plow or shovel. Philadelphia's last one inch or more snowfall was about a month ago, Jan. 5-7, during Winter Storm Helena. New York's Central Park hasn't seen any snow cover since Jan. 15. Even notoriously snowy Boston has only seen 1.4 inches of snow since Jan. 8. Early January's Winter Storm Helena was the heaviest snow event so far this season in Boston (8.3 inches), New York City (6.3 inches) and Philadelphia (4.9 inches). The most persistent storm track so far this winter has featured a southward plunge of the jet stream in the West, with a northward bend of the jet in the East. This has meant the more frequent, heavy snowstorms have been confined from the West to the northern Plains and upper Midwest, while the East has been quite mild. Several locations in the Northeast had one of their top-10-warmest Januaries on record in 2017 – quite a shift from last winter. Winter Storm Jonas in late January 2016 was the heaviest snowstorm of record in Harrisburg, Pennsylvania, Baltimore/Washington International Airport and New York's Central Park, among other locations.